CZT® Mimi Lempart of Florence, MA, and a graduate of the very first CZT class, created this amazing ornate tangle she’s named Mi² (Me Too). Mimi writes, “I don’t often come up with tangle patterns, but this one is inspired by a tiny, intriguing, swatch of wallpaper I saw in a book. I call the pattern ‘Mi² (Me Too).’ As I sketched it out in pencil I realized a similarity to the way the patterns Huggins and W2 begin, except with oval, or seed-like shapes in alternating directions. For me the most challenging part of drawing Mi² (Me Too) was the very first step – getting the seeds spaced and aligned nicely. Reminding myself to take it nice and slow, one deliberate stroke at a time, and doing one row at a time was the way to handle that. From there this tangle comes together very nicely and though it looks very complicated, as you will see from Mimi’s instructions below it is really quite simple. 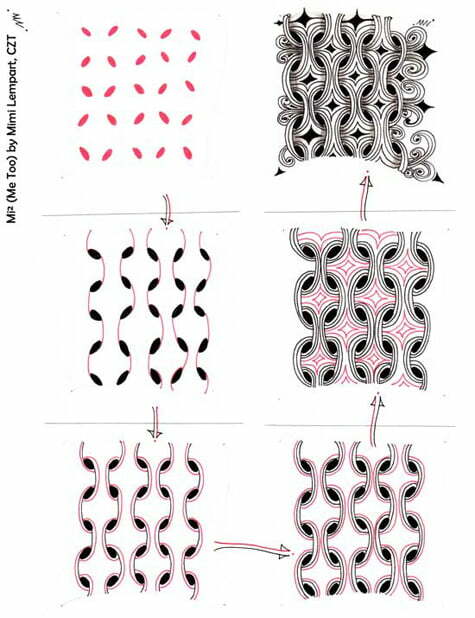 Below the steps are two beautiful monotangle Zentangles by Mimi with examples of ways to vary Mi² (Me Too). GREAT tangle Mimi, thanks for sharing! 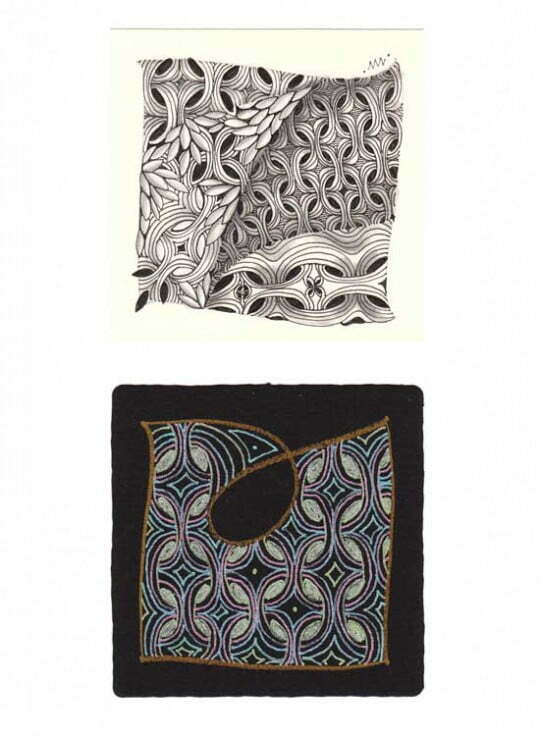 UPDATE: (04/18/2012) For a great way to tame those seed shapes, see Rick Roberts’ steps here on the Zentangle blog. UPDATE: (07/25/2012) Mimi has added her own tips on laying out the seed shapes here on her blog. Ooooo, this looks like a lot of fun! Yay!! So glad to see your tangle here, Mimi! And so great to get a preview over dinner last week 😉 It really is quite a delightful pattern to draw! This is the best new tangle I’ve seen in awhile. Nicely put together and it is absolutely beautiful! Thanks Mimi! Linda, thanks for posting this!!! Mimi- I absolutely love this for many reasons- it is beautiful,playful and seems very flexible! I tried it already and cant wait to play with it some more! Great job!!! Peace & Prayers! This is beautiful! Looking forward to trying this one. Thanks! Thanks, everyone, for all the nice comments about this pattern. When I first saw it as wallpaper, the pattern was elongated vertically which seemed too long for a 3.5-inch tile. But I intend to play with this idea by spacing the vertical seeds farther apart. And thanks, Linda, for this fabulous venue for pattern sharing! What a great tangle! It looks so much more complicated than it is. Thanks for sharing. Ooo la la! I am off to play right now! This is one of my very favorite tangles. I’ve used it lots of times but now I’m off to do some more…oh boy! 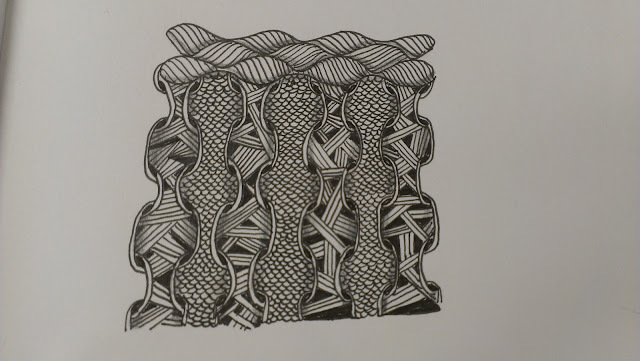 I found the full version quite complicated but doing it to stage 4 and then filling the different ‘sheets’ of pattern with smaller simple tangles and shading gives a great effect. Apologies I just created a quick blog and took a crappy photo with my phone to show you what I mean!